Sew it’s been a while. I’ve been enormously busy finishing my quilt for the Mid Atlantic Quilt Festival…and yes, I finished and I’m now working on my little Milky Way “You are Here” mini. It’s only about 20 x 20 inches and it’s for my part of the space exhibit at MQX. 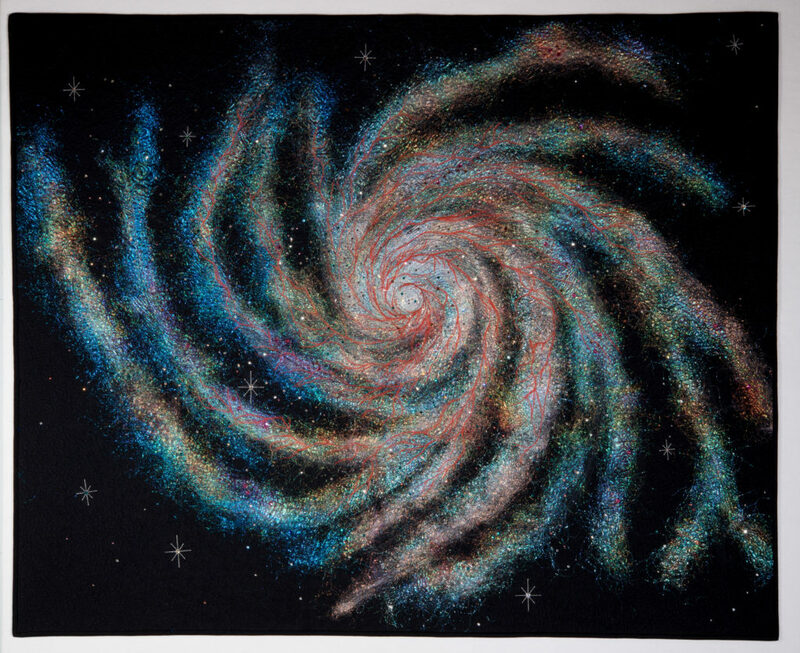 All of my deep space quilts will be there and this is just a little fun piece to show where we are in our home galaxy. 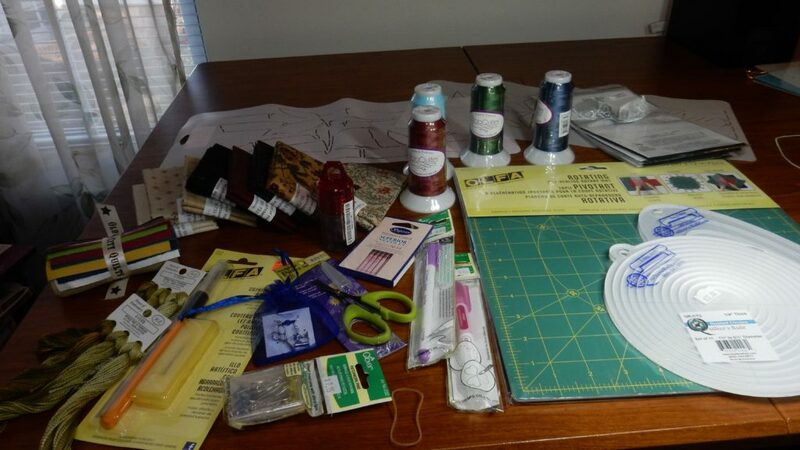 There are a lot of opinions out there in fabric art/quilting land about how to best start and stop your thread. Do you bury it? Do you stitch small stitches and cut close? Do you back it up and cut close? The answers to these questions can frustrate anyone dealing with this issue. Some quilters have no problems with it because they’ve already decided just what they are going to do and do it the same all the time. I however have a plethora of ways to get going and stop. Thicker threads, such as 12 weights and some 30 weights almost require burying in some form because they just show up at the end. Maybe I will just bury them without a knot and carry the thread through the quilt fairly far using a long basting needle. If it works out in my overall quilting, I bury the thicker thread and stitch over the end in my background quilting, but that doesn’t always work. Very thin threads of 50, 60 or 100 weight can easily just be cut close after some close stitching…say 15 stitches per inch (spi), so I never bury those. But what about those 40 weights and specialty threads, such as monopoly and metallics? Well, it has been my experience that these very lively threads WORK better and stay better with a careful back trace stitching and then cut close. I am not sure judges will agree with me, but the thing is, such lively threads WILL come up from a bury even when knotted if certain directions of friction are encountered in the handling of the quilt for shipping and hanging and unhanging. If stitched carefully enough, a backtrack is virtually unnoticeable, except you can probably see it with a magnifying glass and a flashlight. (Did you know that some judges look st your quilts that way?) But I decided my metallics will be backstitched and close cut since they go through a lot when sent to shows. 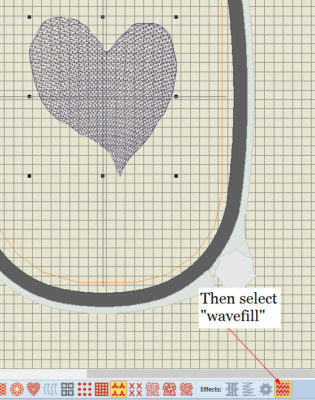 If you decide to do this, go really slowly when you backstitch and get it as exact as possible. The 40 weights are the problem because they aren’t easily determined. Some of them, such as Superior’s Magnifico and Sulky’s rayons are really shiny and show up everything, especially with a high contrast. So in that case, I will probably bury them with the long thread no knot method if I can bring myself to do it. LOL. Some of them, such as Superior’s King Tut, a cotton thread, will melt into the background when the contrast is low. They do well with a short stitch close cut ending. Sew the answer then is either to quilt so well and planned that you NEVER have a start or stop (LOL) or to test the starts and stops before setting out on quilting that special project and decide how you are going to approach it. Also, always be flexible as you go, because when you are quilting certain places you can change your mind. Sew Happy Everyone! May your dreams be met, your life be full of love and simply lovely! By the way, I need some funds to help me keep my dreams for 2018 going, so I am hoping to sell several of my quilts this year to finance my attending the Houston show and keep me in stitches (LOL) and make room in my house for more. You can see which ones on my website gallery…just scroll over the quilt and you can see the price and size. Contact me if you are interested in one and maybe we can work something out that suits your budget. I’ve instituted a lay away plan for the quilts. If you don’t want to buy a quilt but do want to help, there is a donate button on this blog if you are so inclined and the funds will all go to financing my trip or keeping this blog going. I am going to take the second batch of my quilts out to G Street Fabrics in Rockville, Maryland, for the second part of the exhibit of my quilts. 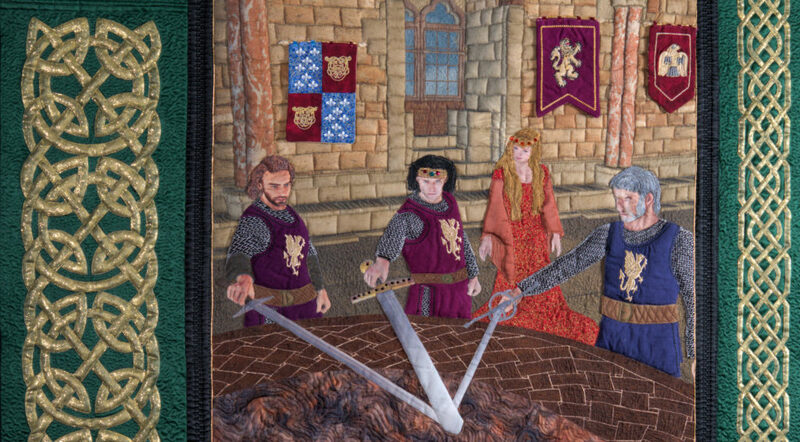 This exhibit, which runs from mid July until the end of August or so, includes nearly all my show quilts except for Pendragon, Dad’s House plan, this year’s Hoffman Challenge still on tour, and a couple I have sold or given away. 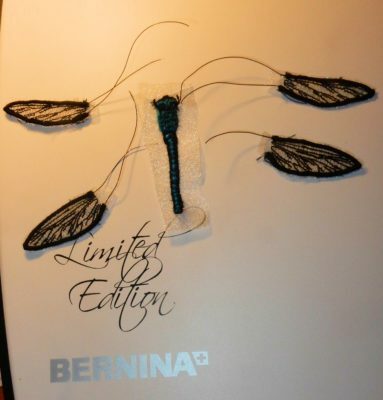 They will be displayed throughout the store, including those that are already there in the Bernina department. I also have completed one new quilt and nearly finished a second new quilt just for this exhibit. Some of these quilts are available for purchase. I will (really) post photos of the exhibit sometime in the latter half of July. Sew here is where I’m at on the preparations. I have completed the second one of my Alfred Shaheen panel quilts and named it “Tropical Garden”. I used a lot of Superior’s new 100 weight polyester thread called Microquilter on both that quilt and the “Field of FLowers” I hope to finish by Friday to include in the exhibit. When I won all thirty colors of Superior’s Microquilter 100 weight polyester from Superior Threads, I was really thrilled. I use almost more 100 weight threads than I do any other thread. 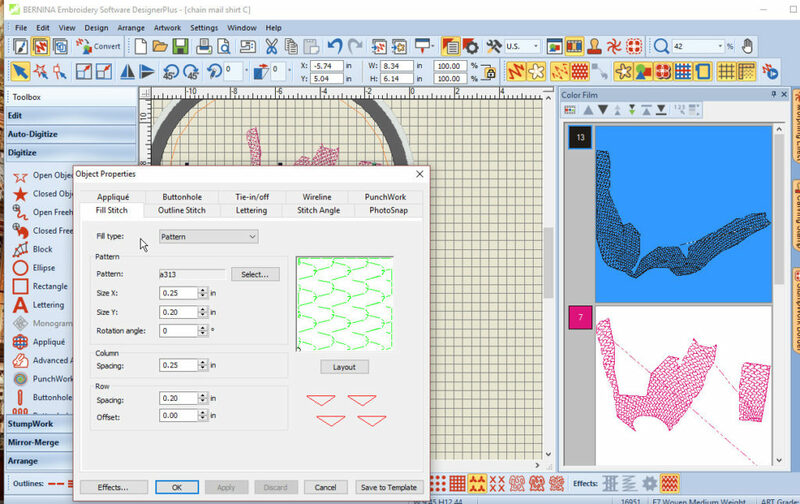 I use it for background quilting, detail thread sketching on things like flowers and line drawings, and I also love it for machine applique. I do not use it for piecing or bobbins. I have found my Q20 works better with a Magic Bobbin Genie sized for M bobbin. I just put it in over the spring in the bobbin. Without it, I have some thread nests on the bottom of my quilt when I get going really fast, and believe me, the Q20 can go REALLY fast. I set the bobbin tension with Superior’s Bottom Line or the Microquilter itself for 180 using the tension guage that came with my machine. If you use the Microquilter in your bobbin don’t wind it full. It works better a little less…starting at about 3/4 full. In the course of making two quilts, I used both Bottom Line that I wound and some prewound Superior thread bobbins that use Bottom Line. I used a size 80 Superior top stitch titanium needle. 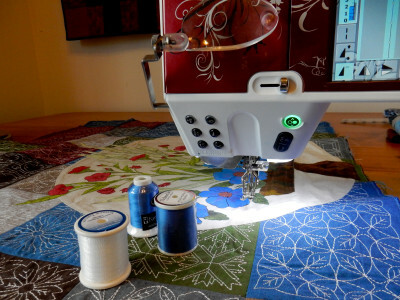 I will provide some pictures of my quilting with Microquilter as soon as I get them taken. I am behind in getting my quilts photographed. I got my little personal app quilt home that was a part of Road to California’s traveling exhibit of app quilts. It has lost about six hot fix crystals out of hundreds, so I need to replace them by Friday. I have one quilt that needs washing and reblocking, which I will do today. I have several more stumpwork butterflies to make for the Field of Flowers and I have to put the rod pocket and label on it. 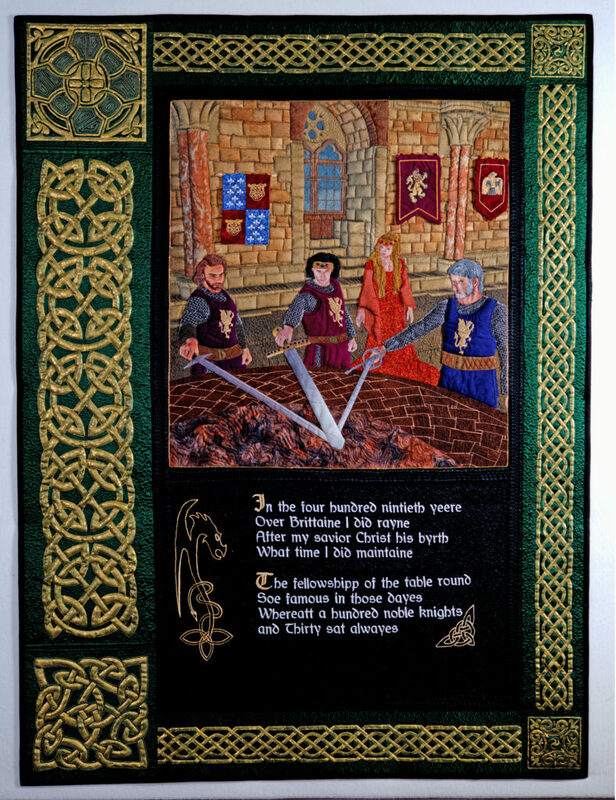 I think I can make the Friday deadline on this one, since the actual quilt is complete and bound. I even have the silver spider charm on the spider web part of that quilt. 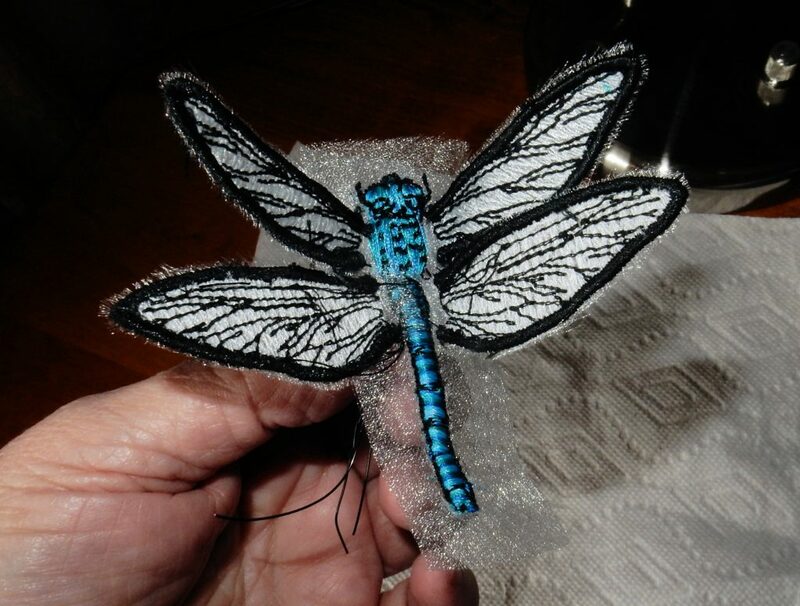 Here’s the dragonfly that is ready to go onto the quilt already. It’s in parts and needs a little additional embroidery after attachment where the wings attach to the body. I will do turned edge applique of the body and hide the wing wires under that. I will also probably darken the little white edges of the sheer to match the stitching. I may even do a hand blanket stitch over the edges if I decide it needs it. The first picture shows the pieces after stitching, and the second picture shows the dragonfly together ready to applique on. 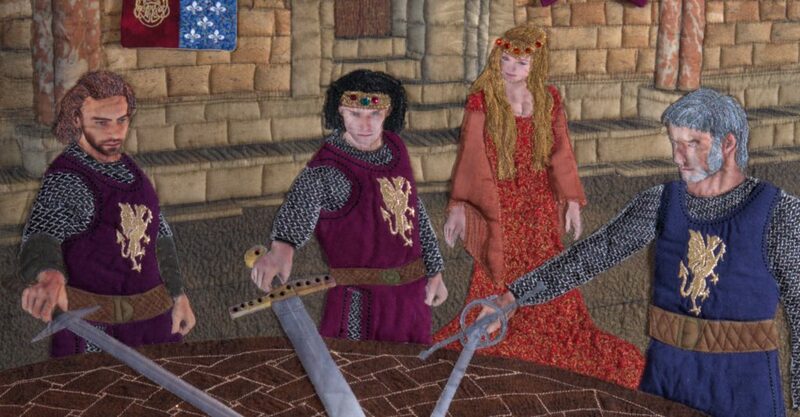 And I also need to ship “Pendragon” to AQS this week. I want to do a little gold paint touch up on the border paint before I ship it. So I have a really busy week ahead of me, but it’s an exciting time. 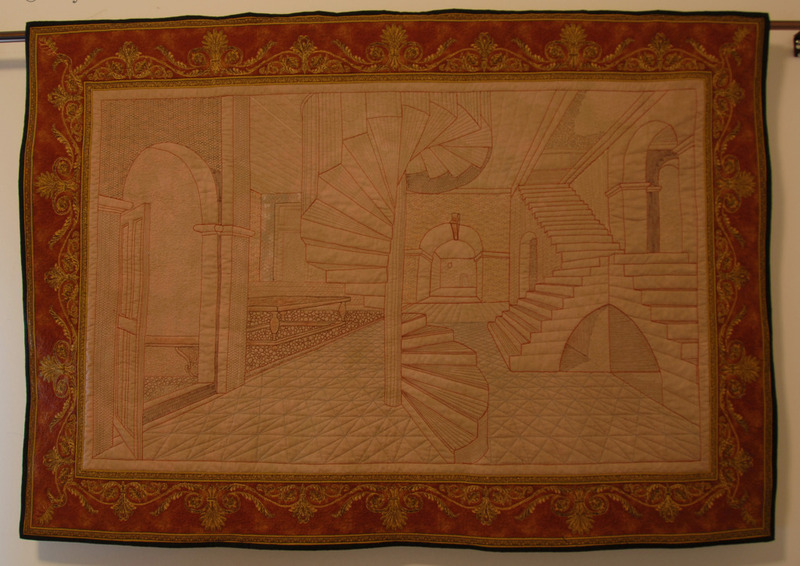 I am enormously pleased that G Street has asked me to show my quilts in the exhibit there. It is a real honor. I hope you have a chance to see it. The whole show will be available in mid-July. I’m not sure of the exact dates, so you might want to call them before you head there. 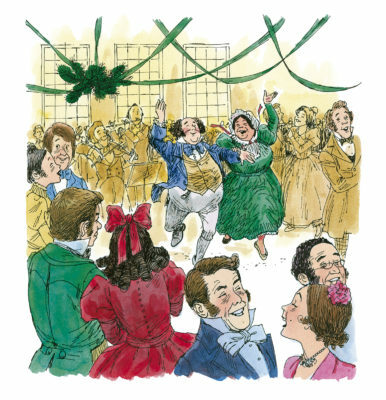 Sew happy everyone! Teach someone to sew or quilt…yourself, you cat, your dog…your son. Until next time! Tags: Having fun in my studio, I love comments., Thank the Lord for all the cool things we have to work with today, What is that crazy B.J. doing now? I’ve been making art quilts now on a serious basis for about 10 years and full time for five! It surprised me when I realized that. 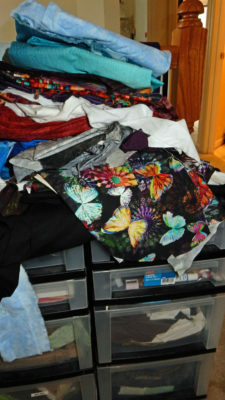 While thinking about that and looking at my bulging and dripping over stash storage, I realize that my quilt needs have changed as I developed my styles over the past ten years. I have enormously increased my thread stash over the years, and recently I jaw-droppingly won Superior Threads giveaway of 30 cones of all 30 colors of their new Microquilter 100 weight. This is a thread I will use a lot and recognized when they introduced it that if it was as good as I expected that I would want a lot of it. What a nice thing! Thanks Superior! So I bought new cone holder to accommodate that. I store my smaller spools in the plastic drawers where I used to store more fabric. I would have a hard time adding much thread into my stash now. I am thankful for this stash and expect to use most of it over the next few years. I use a lot of thread in my wall art quilts. I had originally stocked in a lot of Oriental fabric prints, story prints, and landscape prints in the strong reds, browns, and blues I really love. 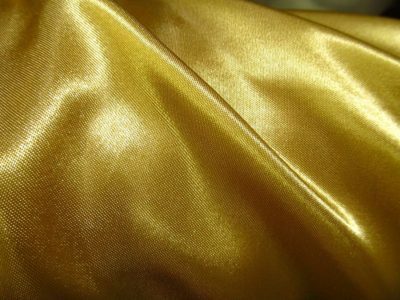 I have increased those fabrics that are either solid or read solid, and I also have large quantity of blacks and whites, and I even have a lot of prepared for dye fabrics. Truly, I could use bolts of blacks, whites, and solid dark blues. I recently used up a bolt of black and had to buy some more. I still love landscape fabrics, and have lots of plans for those. I originally told myself I would never paint a quilt. Sew how has it happened that paints, inks, and other fabric markers have grown into a big stash…not huge, but big? He he he he. 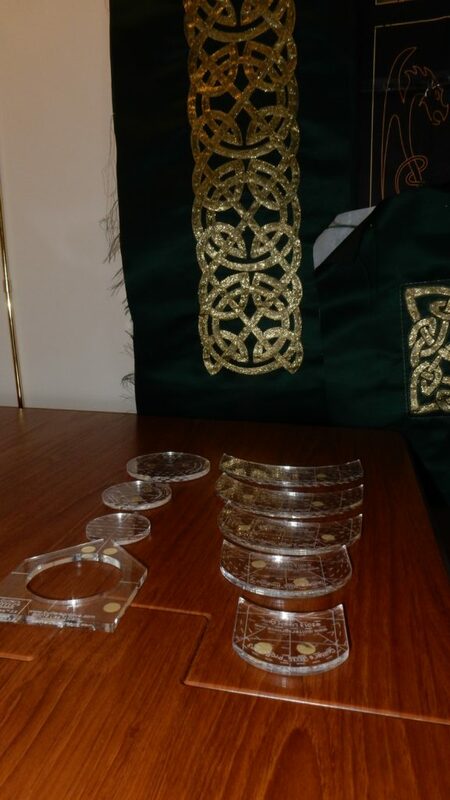 Then there are crystals, beads, and sequins, which I use mostly on space and ancient manuscript quilts with a crystal or two on some of my others. These are small and take little space, but I use them up rapidly when I make one deep space quilt. I don’t buy a lot ahead because it is so expensive. I do watch for big sales in bulk though. I can’t seem to keep enough stabilizers and battings in stock, since I use them a lot and mostly buy them as I need them, so those spaces are about the same. I plan on a little stash busting by making a quilt for my bed and maybe a couple of lap quilts for my home and a charity quilt or two from the parts of the stash I no longer anticipate using in professional art quilts. I will be reducing my stashes throughout this year. The last time I did this was about five years ago when I retired and started full time, and it held up well, but is once again in need of some attention. I refuse to let myself add more storage, because I have plenty to keep enough fabrics, threads, and paints to last me the rest of my life! I must reduce what I have to make it all fit again and make room for the few things I need for specific projects that aren’t already there. This will be an ongoing effort for the next several months, I think…maybe longer. Sew I am well stocked for quilting and sewing, though I could use more cotton-silk Radiance and a few more neutrals. With apologies to those of you who are interested, I will be late in my promise for part two of our stylized landscape project next steps. I have to work through the background to get pictures and maybe even videos and that is taking longer than I anticipated. Nevertheless, I will get part two done in this month. 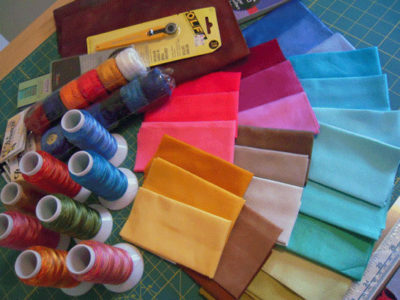 Sew how has your stash changed since you started this activity? Do you need to reduce or add or both? I would love to hear from you about this. 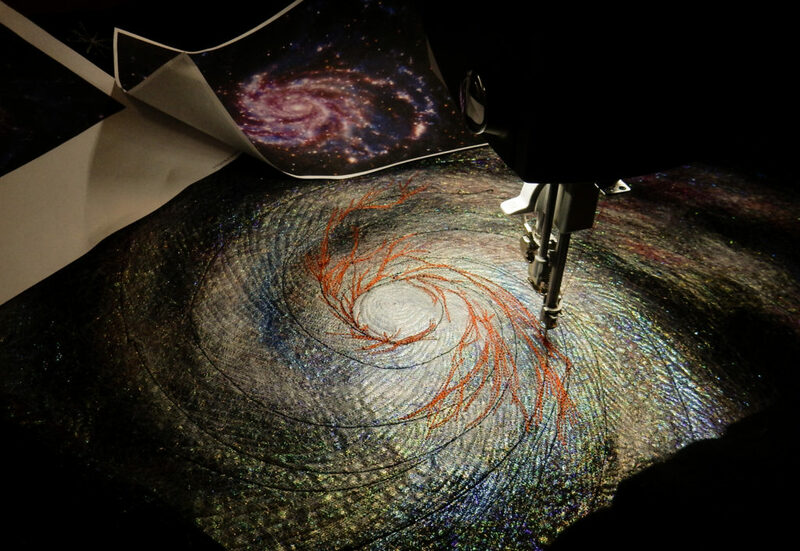 Threads are an interesting, and sometimes a little touchy, subject among machine artists. Lots of us have our favorites and, like me, are what one might call “thread snobs”. So how do I view threads? 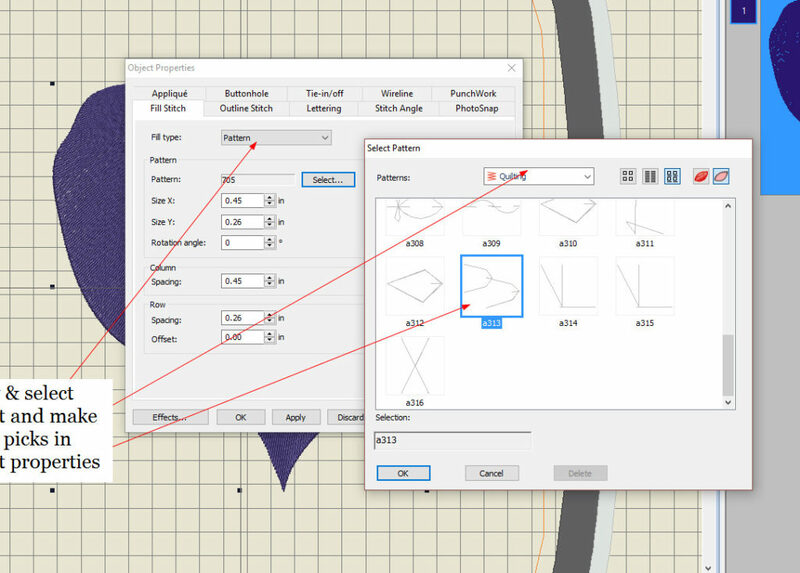 Thread sizes can be used to help with designs. I love doing line-drawing quilts, even though I haven’t done one lately. 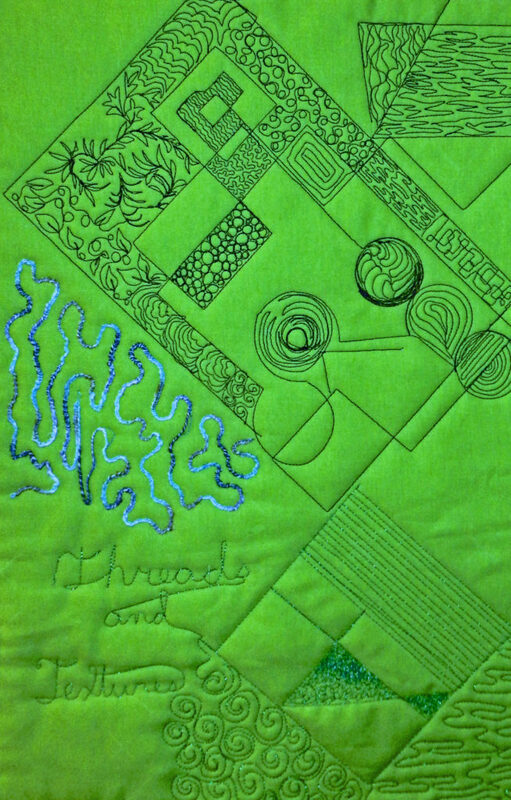 For one of my quilts “Perspective in Threads” I used four thread sizes to act like different sized strokes from different nibs on a drawing pen. I frequently use multiple thread sizes in my quilts. Perspective in Threads This picture could really be a lot better! It is actually nicely squared up, but it doesn’t look like it here, and you can’t really see the contrasts as well as you can in person. Dad’s House Plan. Largely a thread work quilt. 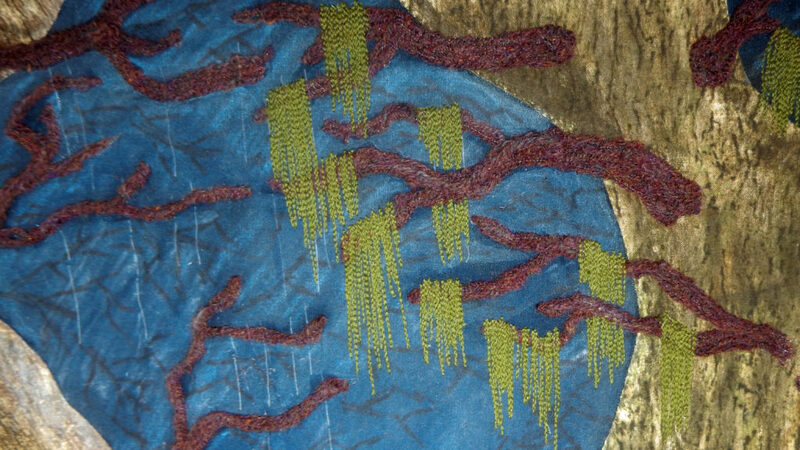 All the landscaping is threadwork, as well as the plans in three different sizes of white threads. So what do I use and how? 100 weight for microquilting, background work I want to more or less sink into the background, and couching down fat specialty threads. 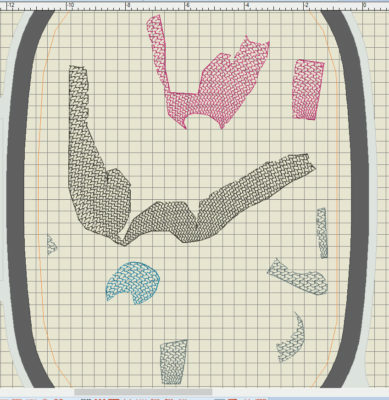 I also use this for machine stitched raw-edge applique and machine stitched turned-edge applique when I want the applique to stand out and not emphasize the edge. 60 weight polyester for most of my bobbin threads when I am quilting and appliqueing and some piecing. 50 weights for clothing construction and some piecing. 40 weight for machine embroidery and quilting when I want the quilting to show up. I have found that some 40 weight cottons, such as Superior’s, show up slightly larger than their polyester threads, and that can be used as an advantage when doing line-drawings. 30 weights for top stitching on clothing. 16 and 12 weight for heavy lines and when I really really want the quilting to show up. 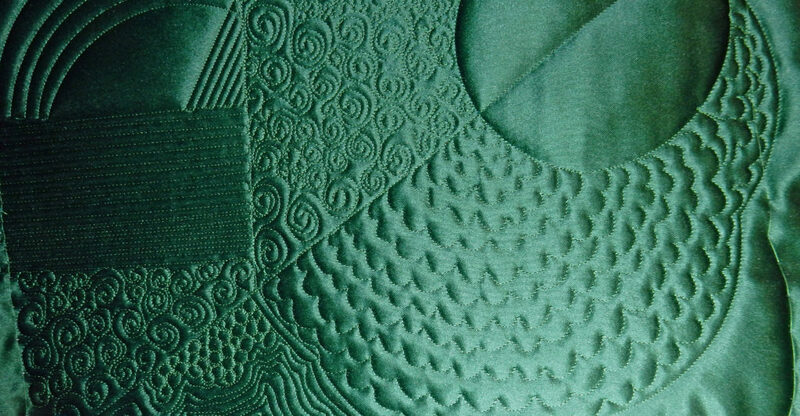 Superior Thread’s light monopoly for really invisible stitch-in-the-ditch and some appliques. Fat specialty threads for bobbin work and couching. I have found that, for the most part, Superior Threads makes some of the best thread on the market, for almost all of the sized threads above. I have heard good things about Aurifil, though I mostly use Superior. I do use Gutterman, Mettler, and So-Fine 50 weights for clothing construction. And for 12 weights, I have tested several brands–though I haven’t tried Aurifil’s–and find that I get the best results from Sulky 12 weight from those I have tested. I tried Superior’s relatively new 12 weight. It’s beautiful, but it is slightly bigger than Sulky and it doesn’t stitch as well in my machines even when I use the largest needles. Sulky 12 weight seems to work just fine, but I’d like to test Aurifil’s. Jenny Lyon’s recent blog post about testing some of the new threads good for microquilting does a great job of reviewing them, so I won’t review them here. But I strongly encourage you to go there and read her review. 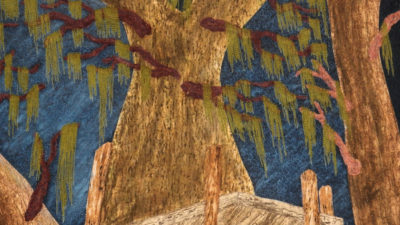 I was interested to see that a fabulous line-drawing style quilt won a ribbon at Houston this week. Here’s a picture of that winning quilt. 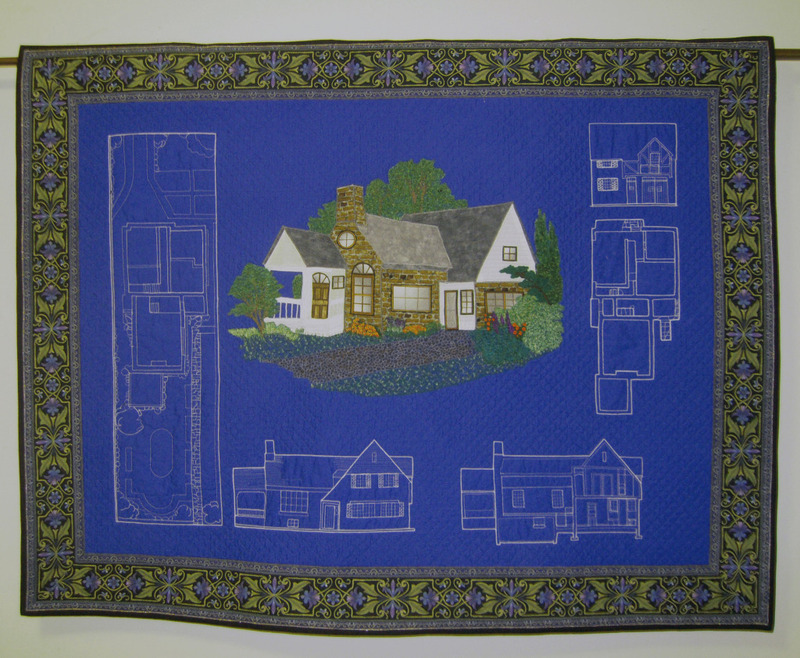 Sew that really inspires me to try my hand at a new line drawing quilt. 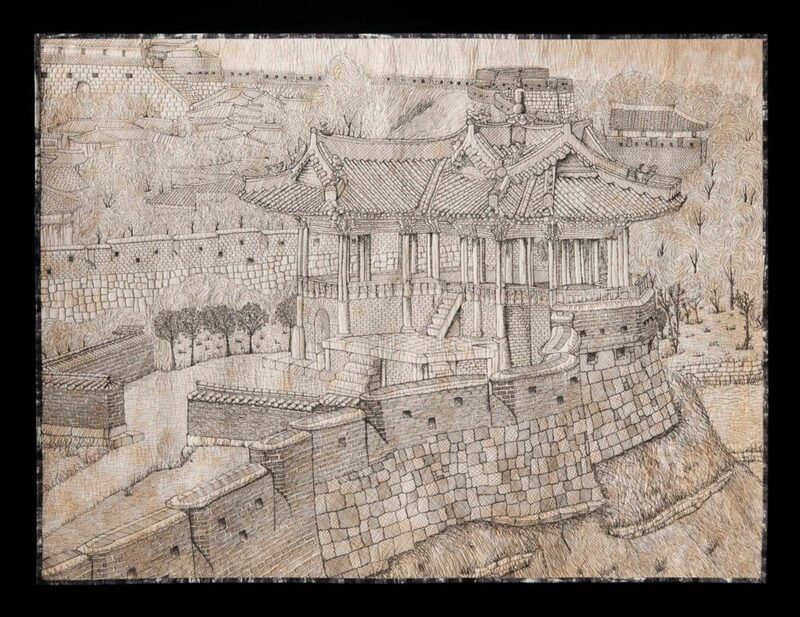 Her work is magnificent, and clearly quite a few cuts above what I have done so far…but I want to try one again. How about you? Sew happy everyone! Try it! Get a solid color fabric, find a non-copyrighted line drawing you like or make one yourself, blow it up to full size (I will address simple pattern making for your own use in my next part of this), and mark it with Crayola washable markers…then sandwich and stitch away happily. Please, if you do this, share pictures with me at bettyjo@bjfabricartist.com even if it is only a practice piece. I would love to share your work here if you would like.